William Amey was born on the 5th March 1881 at Duddeston, in the Aston area of Birmingham, the last-but-one of the eight children of Charles & Elizabeth Amey. When he left school he worked as a chandelier maker for Verity’s Ltd, electrical manufacturers, so presumably had some skill with his hands. After the war, we don’t know much about his employment. William was a prominent member of the British Legion. He attended the VC Garden Party of 1920 at Buckingham Palace and the 1929 VC Dinner at the House of Lords. He received the George VI Coronation Medal of 1937. Almost 20 years after the war, in the autumn of 1938, William Amey married Evelyn “Eve” Haines in Edmonton, Essex. They came to Leamington and lived at 13 Willes Road, naming the house ‘Landrécies’ after the place where he won his VC. Can you imagine the quiet pride as William screwed the nameplate to the door? Can you imagine local people asking what it meant? Sadly, only 18 months later, at the age of 59, William died on the 28th May 1940 at Warneford Hospital. His funeral was attended by two other VC holders. He was buried with full Military Honours in All Saints Cemetery, Brunswick Street Leamington Spa. William served with the 1/8th Battalion, Royal Warwickshire Regiment. It was a first line Territorial Battalion raised at Aston Manor, Birmingham, on the 4th August 1914 – the day war was declared. The Battalion was initially stationed at Chelmsford in Essex before landing at Le Havre in March 1915. The unit fought in France, then went to Italy in November 1917, before returning to the fast moving campaigns in France in September 1918. No service record survives for William, so we do not know exactly when he joined the Battalion. As he has no 1914-15 Star, it was probably after 1916, when he was already aged 35. He was almost certainly a conscript, but it is November 1918 that William Amey is famous for. All hostilities ended on 11th November 1918 and Landrécies turned out to be the Battalion’s last action of the War. Everyone knew the end was coming. The Allies had broken free from trench warfare and were advancing across open country in fire and manoeuvre. With the end so close, would you be tempted to hold back, to be a bit more cautious? It would be perfectly understandable. But Amey did not hold back. 75th Brigade was tasked to seize Landrécies in order to secure the bridgehead to cross the River Sambre. The 1/8th Battalion was on the left flank opposite the small hamlet of Faubourg Sayer. At 6.15am on the 4th November 1918, the battalion attacked – and promptly met stiff opposition. After a very severe firefight, they broke through and secured their objective, the lock on the River Sambre at Landrecies. 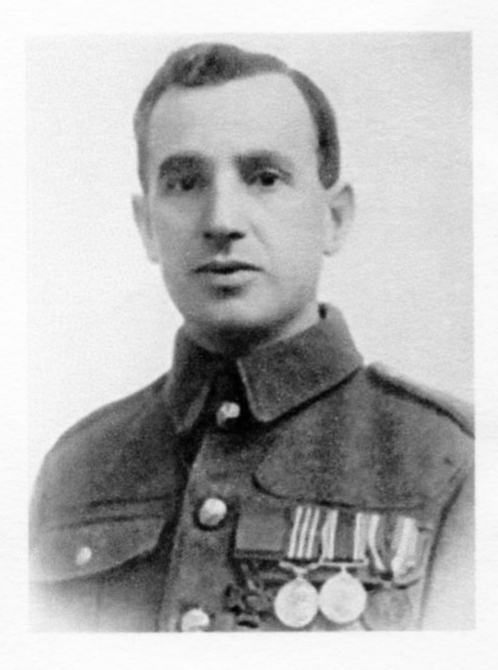 It was during this battle, that newly promoted Corporal William Amey won his VC. “On 4 November 1918 during the attack at Landrécies, owing to fog many hostile machine-gun nests were missed by the leading troops. On his own initiative he led his section against a machine gun nest, under heavy fire, drove the garrison into a neighbouring farm, and finally captured around fifty prisoners and several machine-guns. The citation is a clinical description of his bravery. It cannot give the true picture of close-quarter combat: the early morning fog and chill; the butterflies in the stomach as he waited for H-Hour; perhaps a nervous need to relieve himself. And then the high-pitched noise, the smoke, the crack and thump of MG fire around you, the confusion and shouting. The racing heart, heaving lungs. And then coming face to face with men just as fearful as you and just as determined to blow you away. But regardless, William Amey continued. Amey’s gallantry enabled Faubourg Sayer to be captured, the Battalion to reach their objective, the lock on the Canal, and thus save many British lives. They then continued the advance. Within a week, before the guns fell silent on 11 November, William won the MM (Military Medal). This was the OR equivalent to today’s MC, awarded now to all ranks. And once No 4 in order of precedence. In WW1 awards of the MM did not attract a citation, so we do not know the circumstances. But the MM was only awarded for “exemplary gallantry during active operations against the enemy on land.” So within a week, Corporal Amey displayed two acts of tremendous courage. After the end of the War the Battalion was billeted at Le Cateau with training, parades and fatigue duties, before being employed on salvage work in Cambrai. You can feel the tedium and boredom and the men’s wanting to get home. During February 1919, 1/8 Battalion was disbanded and finally demobilised at Birmingham on the 1st August 1919, almost 5 years to the day that it was formed. How truly rare is the award of a VC? The VC was instituted in 1856, but awards were backdated to 1854 to cover the Crimean War. It has been awarded 1358 times. 628 in WW1, but only 15 in the 70 years after WW2. The Royal Warwickshire Regiment had 31 Battalions in WW1, totalling 47,570 men. Overall, the men of RWR won 6 VCs in WW1. So only 0.01% of RWR won a VC. That’s how rare it is. A fierce pride in themselves and their performance. Their outstanding quality was they had some of the most determined fighters that a General could ever wish to have under his command. 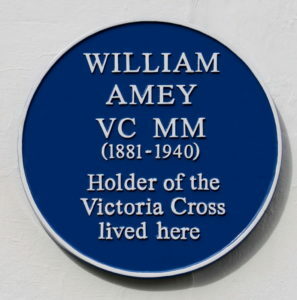 One of those men was Corporal William Amey, and we are proud and pleased to have a Blue Plaque to him, sponsored by Leamington Town Council. His medals can be seen at St Johns House Museum, Warwick.